A tree in the front yard or even the side yard of a home can easily be removed in the manner that is shown in this picture. 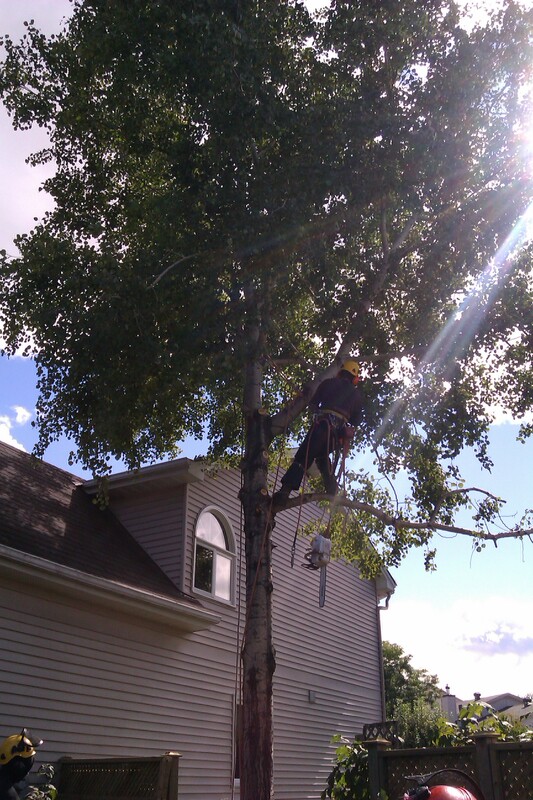 Basically the tree specialist climbs the trunk, cutting off the limbs as he goes until just the trunk remains. There is no need to apply a crane tree removal service in situations such as this. The tree is far enough from the house. There is no danger of anyone or anything being hurt or damaged. The tree does not need to be felled and then cut up. It is basically cut in chunks in place in the air and then lowered to the ground. If you have never seen this type of tree removal process, it is definitely something to watch. These guys are well trained and well equipped with all of the required safety gear. They use a series of ropes to secure and then lower each limb to the ground. Where it is then taken to the street and inserted into a wood chipper. The branches are ground into small wood chips for use as mulch for gardens and for ground cover. The entire process took no more than an hour! There are situations where a crane must be used. While use of a crane is very expensive. The situation will dictate crane tree removal processes due to safety concerns. Or concerns about possible damage to a home or other buildings. In situations such as this, the limb or the trunk of the tree is held in place by the crane. A chain or rope is holding the limb to the crane. As the limb is cut the crane then will lift the tree limb over the home. Then out to the road where it will be chipped into small pieces. Sometimes large limbs may over hang a house or some other building. They cannot be dropped with out the use of a crane to hold it while it is being cut at the trunk. If there is no access to a back yard for example, or the tree limbs cannot be carried from the back of the home to the front of the home where the wood chipper is, a crane might be used as well. Sometimes they will cut the limbs and trunk of the tree into small enough pieces, however if this does not work then there is no alternative but to use a crane to remove the tree. Talk to your professional tree removal company to determine the best course of action to ensure that both buildings as well as humans can be kept safe while this work is being carried out. Always inquire how the tree will be cut down and removed. Make sure you are personally comfortable with the process to ensure that you home and property is not damaged. They also should explain how the cleanup process will also work and what you will have to do at the end of it all.